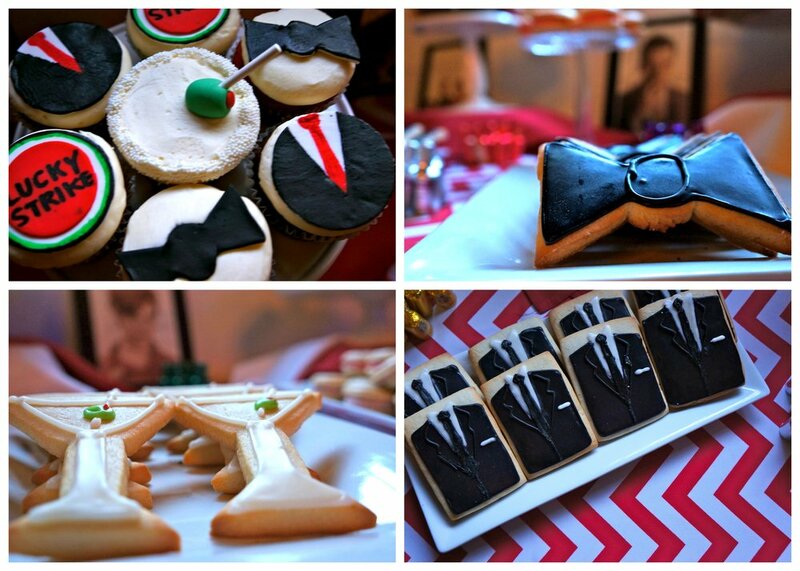 If you haven't picked up on it yet, we're kind of obsessed with theme parties here at TAS! So when it came to planning Chris' 30th Birthday, we knew that we wanted to incorporate a theme that was classy, stylish and most importantly MANLY. We got to thinking and decided that no one exemplifies these attributes better than Don Draper and the cast of MAD MEN. And low and behold, our theme was born. The party was held at the newly opened restaurant Garage, located in the heart of downtown Northville, MI. Their private banquet room, appropriately named the "Model A" Room, had a view of a beautifully restored 1930 Ford Model A car that created the perfect setting for our vintage affair!The food was amazing - all night the guests raved about the hors d'oeuvres (Seared Ahi Tuna Canapés with Soy Wasabi Mayonnaise, Beef Tenderloin Croustades with Chevre Cheese & Balsamic Reduction, Spanikopita, Maryland Crab Cakes with Lemon Aioli, Mini Risotto Balls Stuffed with Fontina Cheese). All of the guests were asked to wear late 50's/early 60's attire inspired by the TV show, which made for some great pictures! 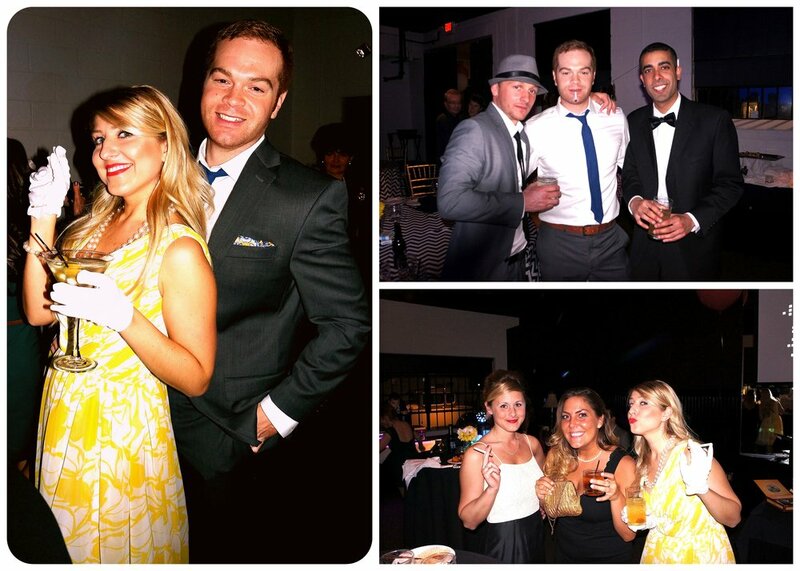 I paired my yellow chiffon cocktail dress from Unique Vintage with white gloves, pearls and red lipstick...oh, and let's not forget about that fake cigarette from Party City, that didn't leave my side that night! 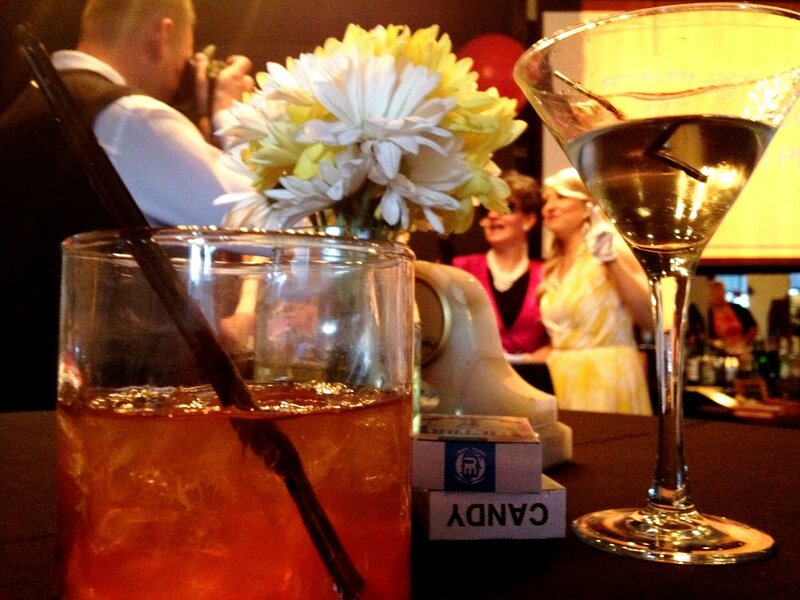 As an event planner, I know that hosting a great event is all in the details. From the vintage typewriter & telephone, issues of LIFE, Look and McCall Magazines from the 60's, to the chevron linens (Linen Hero) & flower centerpieces, we certainly didn't hold back when it came to the decor! We had so much fun looking for all of these vintage props, which were compiled over a span of 6 months! Chocolate Cigars paired with these adorable custom matchboxes completed the look for our cigar bar. Because what goes better with Scotch and Whiskey than a chocolate cigar, right? Joan Holloway & company with cocktails in hand, pose for a quick photo at the vintage photobooth! With that gorgeous hunter green dress, vintage pearl necklace and vibrant red hair, I'm pretty sure Justyna's (Creative Manager at TAS) striking resemblance to Joan (Christina Hendricks) made most of our guests do a double take! Guests danced the night away to classic oldies tunes featuring Frank Sinatra, Ella Fitzgerald, Julie London and Bob Dylan. I think it's safe to say that everyone had a SWELL time!